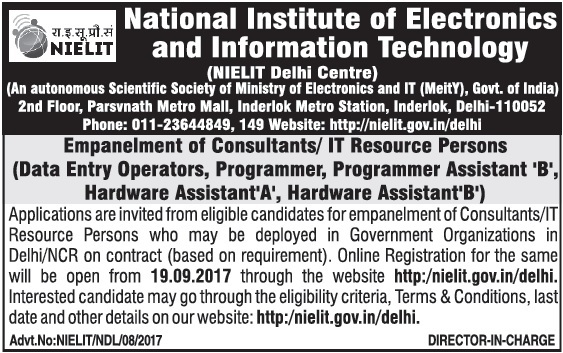 National Institute of Electronics and Information Technology (NIELIT Delhi Centre) latest recruitment notification is out. According to the notification applications are invited Applications from eligible candidates for filling up the posts of Consultants/IT Resource Persons who may be deployed in Government Organizations in Delhi/NCR on contract (based on requirement). The candidates have to apply online by doing Online Registration that will be open from 19.09.2017 through the website nielit.gov.iin/delhi. Interested candidate may go through the eligibility criteria, Terms & Conditions, last date and other details below. Following are the details of the vacant post under NIELIT Recruitment 2017 with required educational qualification , pay band , Age Limit ,number of vacancies, experience etc. Pay band : Rs. 16,468/- p.m.
Age limit : Age should not be more than 35 years as on 09.10 .2017 provided that in the case of candidates belonging to special categories, the upper age limit shall be subject to such relaxation as may be made by Government from time to time. Experience: At least one year experience in large software Designing & Development using VB, .Net, JAVA, JSP, D2K, SQL server/Oracle 8i/9i DBA, WIN NT/Linux with knowledge of Hardware and Networking. Pay band : Rs 21634/- to 26,400/- p.m. Experience: At least one year experience. Pay band : Rs 16641/- to 20,400/- p.m.
7+ years in Data Center/NOC Projects.  Experience in working in Central/State/Integrated Mission Mode Projects. Age limit : Age should not be more than 40 years as on 09.10 .2017 provided that in the case of candidates belonging to special categories, the upper age limit shall be subject to such relaxation as may be made by Government from time to time. 5+ years in sys admin of RDBMS data (MS-SQL, Oracle etc. ), Sys admin, windows2000/LINUX/AIX.  Good analytical and problem-solving approach. 5+ years in Network/Security field. • Beginner’s knowledge in Information Security technologies like anti-virus, Firewalls, 2 & 3 factor authentication, IDS, IPS, Content filtering, Encryption, VPN, Threat Management and familiarity with Information Security Audit parameters. • Hands-on exp. in network design, implementation, information security, architecture and its deployment. • Experience in working in Central/State/Integrated Mission Mode Projects. • Good analytical and problem-solving approach. Interested and Eligible Applicants are required to apply online from 19-09-2017 to 09-10-2017 through the website http://nielit.gov.in/delhi (under Recruitment section). The dates of interview/Typing Test will be published on the website. No other mode of application will be accepted in any case. The application fees shall be Rs. 600/- for General/OBC category and Rs.300/- for SC/ST/PWD/Women category to be paid through online mode only. Application Fee once paid is non-refundable and non-transferable in any case. Fee through any other mode like DD, Payorder, Cheque, Challan, etc. will not be accepted. Successful submission of application will be considered after payment of prescribed fees. Those candidates, whose application are successfully submitted, will be called for the Interview/Typing Test. For Data Entry Operators there will be only typing test. Only those candidates who are shortlisted after the Interview/Typing Test and clear the Document Verification will be empanelled as Consultants/ IT resource Persons. Document verification will be held on the date of Typing Test/ Interview. The interested applicants are advised to go through the Eligibility criteria carefully and ascertain themselves regarding their eligibility. The shortlisted candidates will be empanelled for deployment on projects in various Govt. Depts. by NIELIT Delhi centre, on contract basis, initially for the period of six months ( which may be further extended based on requirements/performance of the candidate) or upto contract period of NIELIT with the client/user department. NIELIT does not guarantee deployment of all shortlisted candidates from panel. Final selection of candidates for empanelment will be based on the performance of the candidates in the interview/Typing Test and as found eligible as per prescribed criteria. NIELIT may conduct written test or skill test for screening the candidates before interview, if felt necessary. No TA/DA will be provided to candidates for appearing for the Interview/Typing Test. The place of deployment will be Delhi/NCR/near by places. Candidates must be willing to travel to any place outside Delhi as part of their job. They can be temporarily posted outside Delhi, if required, by the user department. They may work on shift/ rotational basis as per department requirement. Candidates with last semester result awaited or incomplete degrees are not eligible to apply. The cut off date for calculating age and experience will be the last date of submission of the form i.e. 09-10-2017. In case, last date is extended, the date of determining eligibility will not change. The name of the candidate in the application form must be the same as mentioned in the certificate of class X. In case the candidate has changed his name subsequent to Class X, the evidence to that effect should be furnished at the time of interview. Canvassing/trying to influence NIELIT employees to secure the job in any manner shall disqualify the candidate. NIELIT Delhi has the right to accept or reject the application without assigning any reason thereof. The applicants are advised to keep visiting the website of NIELIT Delhi centre http://nielit.gov.in/delhi for schedule of Interview/Typing Test or any update. For more Details of NIELIT Recruitment 2017 click here.